This shows how to wire up the bag using individual NeoPixels. 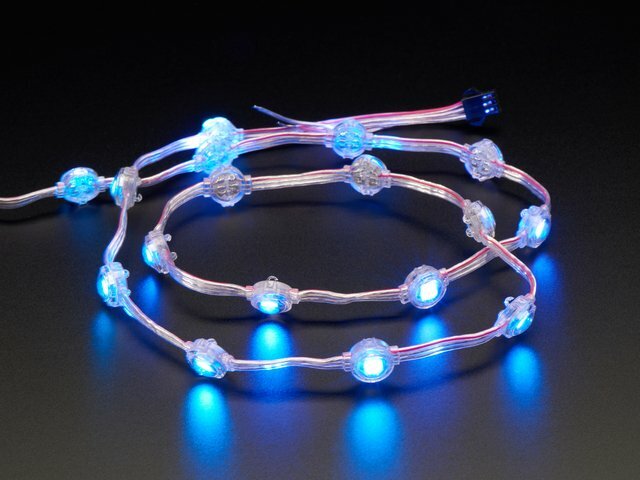 You could also use the NeoPixel Light Strand -- these pixels are already soldered together and could be wired up to the Circuit Playground quickly and easily. It doesn't give you quite as much control over spacing, and your bag will feel a little stiffer, but it's a great option if you don't want to do a lot of soldering. Cut your fabric to the size you want your bag. Mine is about 14" by 16", making a 14" x 8" bag when it's folded over and sewn. Lay out the pixels and the Circuit Playground on the back of your fabric on the side that will become the front of the bag. Remember to place the Circuit Playground face down, so the pixels shine outwards. Mark where you want each pixel to go. Now we'll wire up the pixels. Measure out the white, red, and black wire going to pixel #1 against your design and solder them to the A1, VOUT and G pads as shown in the wiring diagram. Measure out the red and black wires going to pixel #2 and twist them together with the first wires. 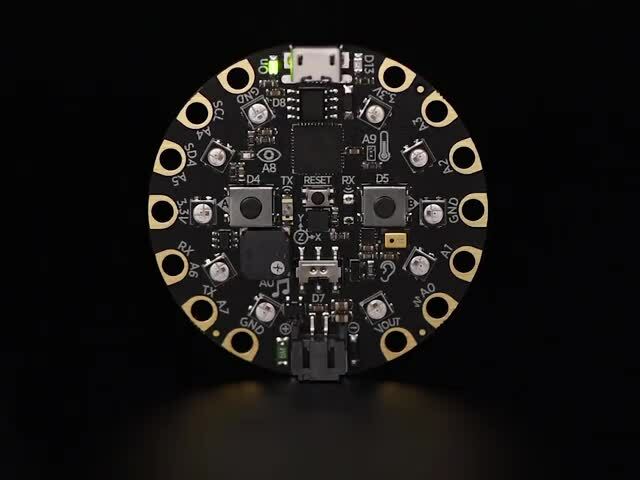 You'll want to solder both into the + and - holes on the pixel at the same time. Solder the white wire into the IN pad on the pixel. Then measure out the white wire going to pixel #2 and solder it to pixel #1's OUT pad. 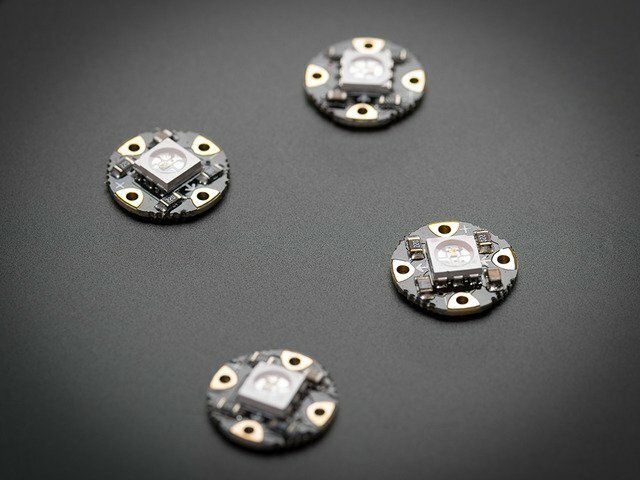 Continue measuring and soldering each pixel in order, making sure the wire lengths are about right for your design. 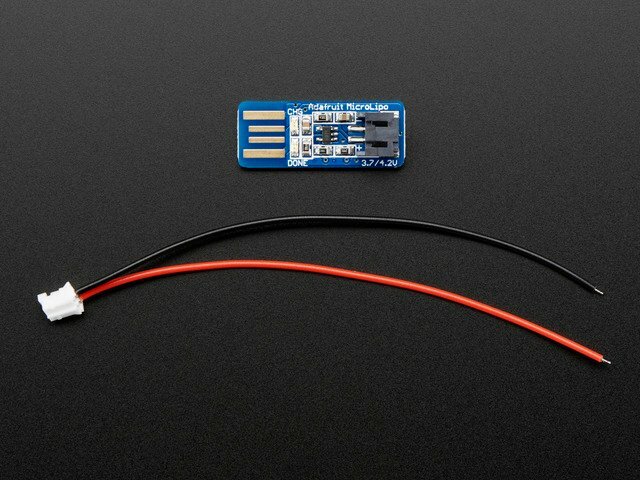 Once you've got all the pixels soldered up, plug your Circuit Playground into your computer and download the test sketch (linked below). Make sure all the pixels light up! If they don't, check to make sure your solder connections are all good, and that you've soldered each pixel in the right orientation. It's easy to get the IN and OUT pads mixed up, and much harder to fix after your project is assembled, so don't skip this step! Click "Download" and drag the resulting file onto the CPLAYBOOT drive that appears when you plug in your Circuit Playground and click the Reset button. This sketch will light up a strand of pixels on pin A1 with a rainbow animation. Pretty! You can move on to the coding step from here, or continue and finish the bag assembly first. Attach your pixels to your fabric following your design. I used E6000 glue to glue the pixels down, and then I used a needle and thread to secure the Circuit Playground face-down against the fabric. Sewing is best -- it's not a great idea to soak your Circuit Playground board in glue. Remember to face the pixels down into the fabric so they show from the outside. Also, do NOT turn the pixels on while the glue is wet. The wet glue can act as a conductor and short out your pixels (so be patient!). Make a pocket for your battery inside the bag, near the top where it's easy to get to for charging. Glue or hand-sew a small piece of felt on the inside of the bag. Thread the battery extension cable up through the bottom of the pocket before you secure it down. 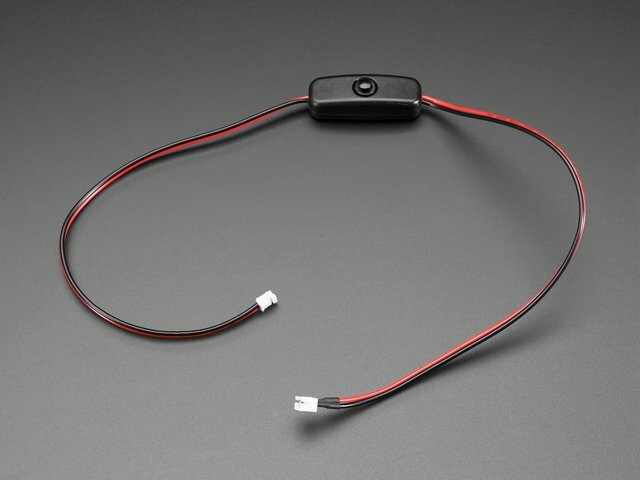 Carefully wind a rubber band around the battery and the wires, holding the wires against the body of the battery. This will provide strain relief -- the solder points for these wires are really delicate and break easily unless the wires are secured. Cut a piece of felt or fleece the same size as your fabric. This will become an inner liner for your bag, so you can show it empty and/or use it to hold things, without getting tangled up in the wires. Fold both pieces of fabric with RIGHT sides together, then sew along the side and bottom edge. Turn the main bag right-side out, but leave the inner bag inside-out. Place the inner bag inside the main bag and sew carefully around the top edge, leaving an opening so you can get the battery in and out. You can add trim or decorations to your main bag at this time too. If you are using a fun-fur type fabric, you can cut a small slit right by the USB port of your Circuit Playground Express for easy programming. This guide was first published on Oct 30, 2018. It was last updated on Oct 30, 2018. This page (Assembly) was last updated on Apr 16, 2019.